I'm pretty sure Spring was meant to have started by now, so why oh why is it still so cold. I hate to admit it but I've even had to have my heating on this week just to stay warm. However even though my hands hands have been freezing, I've still managed to hold up my phone and carry on with project 365. You may notice a difference in the photos towards the end of the week because I took the plunge and switched from an iPhone to an android eeekk!!! Sunday we decided to plant the flowers the girls had been growing. We had to do this inbetween rain showers, now to wait and watch them continue to grow. Elise and Freya were making bracelets, Gracie managed to get olive fingers and Layla was eating a whole apple for the first time (normally she has it cut in slices). 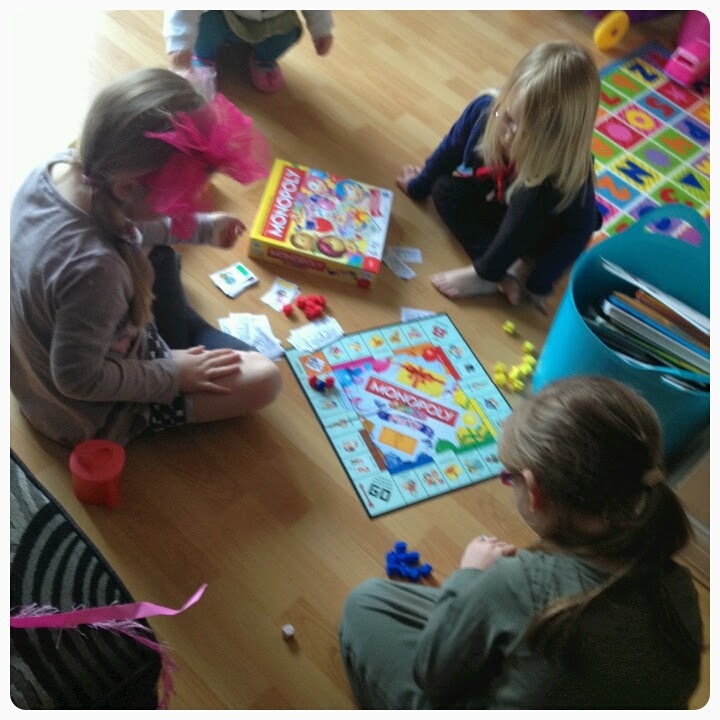 Time for a spot of monopoly, junior party monopoly to be precise. I don't think the girls quite understood the rules but they were having fun regardless. The girls were pairing off to play and not in the usual pairs either. Gracie was helping Layla and pushing her around on pooh bear whilst Elise and Freya were sharing the latest edition of Girl Talk. 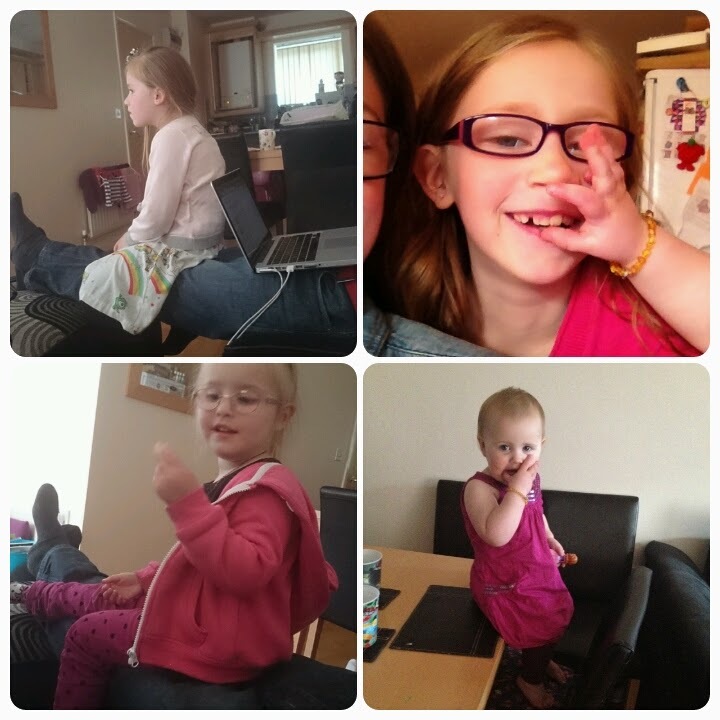 Freya and Gracie found a comfy seat in daddy hazeldens lap, Elise was being attacked by a baby and Layla was sitting somewhere where she shouldn't be, little monkey. Layla decided to nap in my bed today. Freya wasn't in the mood for picture taking but I wanted to get a photo of the crown she made. Gracie had a beautiful butterfly painted on her face and Elise was busy watering her flowers. I do love the garden photo's and the girls chatting-lovely. How are you getting on with the Android? Funnily enough I've just gone the other way and now have an iPhone. 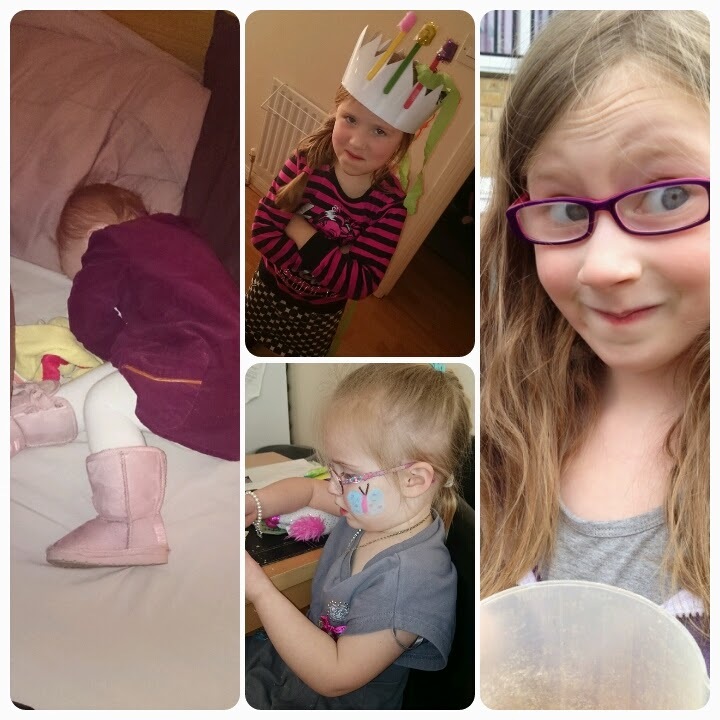 some lovely photos honey, gosh your brave swapping .. can i spy a sunglasses stand next to your bed?? i love it! That planting day is great and I love the Girls are Amazing T Shirt. Clio is wearing hers too even though it comes to her knees! Ouch daddies poor legs. Look forward to seeing the flowers grow over the coming months, well done girls. 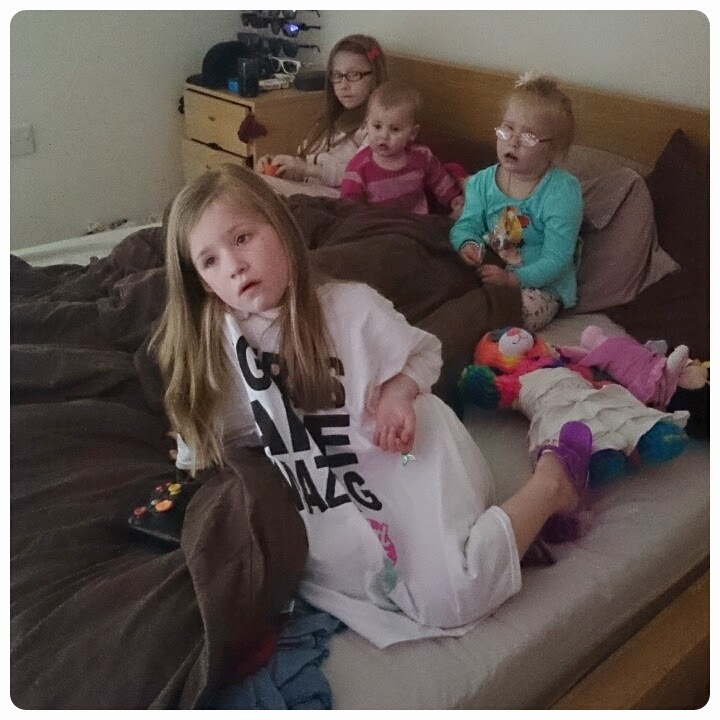 Love the 4 comatose faces as they stare at tv, think we all deserve chill out time, have to wonder how long before the bickering started? Sounds like a busy week! I love the idea of a lazy Saturday! I'm very impressed you've managed to capture all 4 of them everyday still. How are you finding your Android? I have a Samsung Mini and think it's good (but I have never had an iPhone). Android rules!! Love my phone and tablet both android. I used to play monopoly as a child and with our two boys. We never followed the 'proper' rules, just played our way. Love the wonderful flower planting photos, so hopeful for Spring and Summer.